Here’s the weekly roundup of six word story explanations. As always, the six word story is the caption under the photo and the explanation follows the caption. Play, dogs, play. No TV today. I came up with a children’s story for this prompt and it is as straightforward as the picture appears. 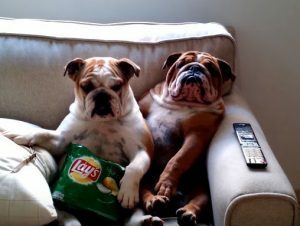 Two lazy dogs hoping to spend the day in front of the television. Instead, they get kicked off the couch, go outside, and learn how to play again. Clearly inspired by the book, Go, Dog. Go!, which happened to be a favorite of one of my daughters a little while ago. Tell me how edgy I am. Something about this writing prompt annoyed me. Whatever it was, my first thought was of an artist who’s trying too hard. In this case, it’s a photographer who’s become quite famous for her work. Unfortunately, her priorities have become less about creating great photos and more about hearing how awesome and cutting edge her photos are. And so one day, she comes up with this photo, which is supposed to be very radical, but is really just two people holding balloons in front of their heads. (although to be fair, given a different context, the reception of this photo might be entirely different – this story was purely based on my initial reaction). Unfortunately, the critical reception of this photo is not what the artist expected. It’s not well received and is a tipping point in the photographer’s career. She begins to lose work, and loses publication, and soon all that gratification dries up. She starts to see articles about, ‘whatever happened to So-and-so?’ and gets very depressed and when she hits the bottom, she of course reconnects with the artistry of photography and rediscovers the joy it once brought her. Never turn your back on koalas. 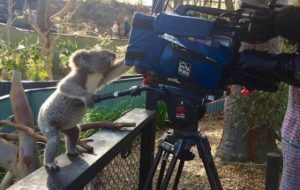 Animals are cute, and what could be cuter than a koala working a television camera? Maybe if the koala filmed something that wasn’t supposed to be filmed. In this story, a cameraman and news reporter are having an affair. They head out for a story and get set up early and waiting to kill some time, decide to share a quick kiss. Unfortunately for them, a curious koala figured out how to turn on the camera and the whole episode is filmed. I didn’t develop the rest of the story, but it would more or less have been about these two trying to pick up the pieces of their relationships. A couple of comments about technique here, because I wasn’t all that happy with this story. First, I wasn’t satisfied with the six words and strongly preferred, ‘Never turn your back on a koala.’ No matter how I tried though, I couldn’t pare this down to six words in the ten minutes I gave myself. It happens, happens a lot! Second, on closer examination I see that I missed the people walking in the background. At first I thought this was an isolated location, which explained why the couple felt they could steal a kiss, but not sure that interpretation works given there are other people on site. Still, the story could still be valid by changing what the pair were doing. Instead of kissing, they could be running down their boss or other co-workers. All good! Just once could we finish dinner? This gentleman isn’t ignoring his girlfriend on purpose – he’s working. And most times, she’s totally fine with that because she enjoys the expensive wine she’s drinking at the expensive restaurant they’re sitting in. She also loves the expensive dress she’s wearing and the expensive earrings and the expensive car they drove to get to the restaurant and she can’t wait to get back to their expensive home. On top of all that, is it too much to ask that once, just once, her boyfriend could give her his full attention? Well none of that expensive stuff is free, so yes, it actually is too much to ask and she’d thought she’d been happy with that tradeoff. But when they came to this dinner and the lady saw how happy her other friends are – friends with much less disposable income – she began to wonder what exactly she might have traded away. Therefore, this story is all about how money can’t buy happiness.